Route Summary: - Buttermere, Gatesgarth, Peggy's Bridge, Buttermere, Scarth Gap, Hay Stacks, Innominate Tarn, Hay Stacks (Haystacks), Scarth Gap, Peggy's Bridge, Gatesgarth, Buttermere. 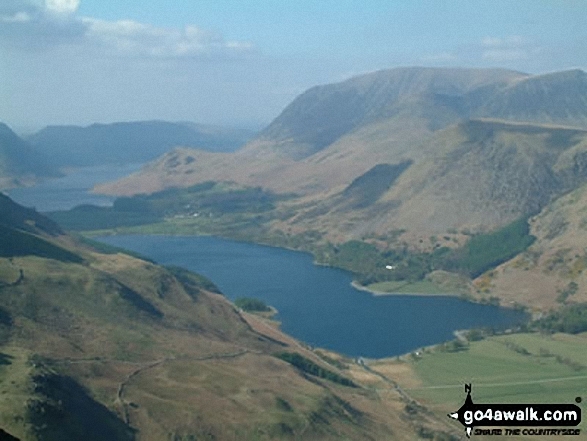 Route Summary: - Buttermere, Gatesgarth, Peggy's Bridge, Buttermere, Scarth Gap, Hay Stacks (Haystacks), Innominate Tarn, Blackbeck Tarn, Black Beck, Green Crag (Buttermere), Warnscale Beck, Dubs Quarry, Fleetwith Pike, Fleetwith Edge, Gatesgarth, Buttermere. Route Summary: - Buttermere, Gatesgarth, Warnscale Bottom, Warnscale Beck, Green Crag (Buttermere), Black Beck, Blackbeck Tarn, Innominate Tarn, Hay Stacks (Haystacks), Scarth Gap, Burtness Wood, Buttermere. Route Summary: - Honister Pass, Honister Hause, Green Crag (Buttermere), Black Beck, Blackbeck Tarn, Innominate Tarn, Hay Stacks (Haystacks), Scarth Gap, Ennerdale, River Liza, Black Sail Hut (Youth Hostel), Black Sail Path, Kirk Fell, Kirk Fell (East Top), Beckhead Tarn, Beck Head, Great Gable, Westmorland Cairn, Windy Gap, Green Gable, Gillercomb Head, Brandreth, Grey Knotts, Honister Hause. Route Summary: - Buttermere, Scale Force, Scale Beck, Blea Crag, Lingcomb Edge, Red Pike (Buttermere), High Stile, High Crag (Buttermere), Gamlin End, Seat (Buttermere), Scarth Gap, Hay Stacks (Haystacks), Innominate Tarn, Blackbeck Tarn, Black Beck, Green Crag (Buttermere), Warnscale Beck, Warnscale Bottom, Gatesgarth, Buttermere. Route Summary: - Bowness Knott Car Park Ennerdale, Low Gillerthwaite Field Centre, High Gillerthwaite Yourth Hostel, Red Pike (Buttermere), High Stile, High Crag (Buttermere), Seat (Buttermere), Scarth Gap, Hay Stacks (Haystacks), Innominate Tarn, Blackbeck Tarn, Black Beck, Green Crag (Buttermere), Great Round How, Brandreth, Gillercomb Head, Green Gable, Windy Gap, Great Gable, Westmorland Cairn, Beck Head, Beckhead Tarn, Kirk Fell (East Top), Kirk Fell, Black Sail Pass, Looking Stead (Pillar), High Level Route, Robinson's Cairn, Pillar, Wind Gap, Black Crag (Pillar), High Beck, Low Beck, Ennerdale. Route Summary: - Buttermere, Scale Force, Scale Beck, Blea Crag, Great Borne, Starling Dodd, Little Dodd (Buttermere), Ling Comb, Lingcomb Edge, Red Pike (Buttermere), High Stile, High Crag (Buttermere), Gamlin End, Seat (Buttermere), Scarth Gap, Hay Stacks (Haystacks), Innominate Tarn, Blackbeck Tarn, Black Beck, Green Crag (Buttermere), Warnscale Beck, Dubs Quarry, Fleetwith Pike, Fleetwith Edge, Gatesgarth, Buttermere.